The winds and seas are building from the northeast today instead of from the north like yesterday. We're also seeing the beginnings of a significant southwest swell, no doubt from a storm hopefully well to the south of us. The upcoming weather continues to be a big question mark. Both the cloud patterns and the wind directions suggest a change is coming, but to what, we don't know. 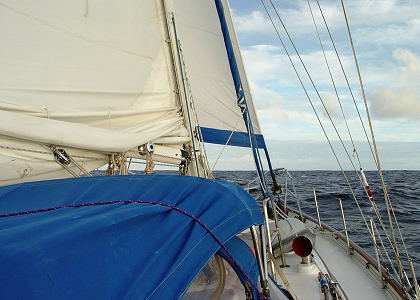 At 12:00 noon we were about 250 miles from Easter Island, and at 5.5 knots it will take us about two full days, arriving Thursday mid-day or so. It would be nice if bad weather would hold off until then, but who knows. I unthinkingly snapped at Marcie this morning over a trivial matter and made her cry. Boy did I regret that. She is stressed, like all of us, by the cumulative problems over the past number of days, which have been upsetting. Also, she is a very meticulous and thorough trip-planner, and now all their upcoming plans have been trashed and must be redone. Plus, I think it's got to cause at least a little concern, even to somebody as anxiety-free as Marcie, over the prospects of hand-steering 2,000+ miles back to Ecuador. Then the two-hour on / four-hour off watch schedule, 24-hours a day, rain or shine, day or night, day after day, takes a toll on everybody, physically and mentally. There is little or no opportunity for quality sleep, or doing much of anything else significant. This part of cruising is a tough life, make no mistake about it. Late in the day, David saved the day yet again by getting the autopilot to work. This time, he did it by completely rewiring the autopilot, making a temporary installation below decks to simplify the rewiring job. Apparently the old wiring had deteriorated to the point that the autopilot could no longer function properly. For the temporary installation, he mounted the electronics box below decks to minimize the wiring runs, then got good clean power right from the battery bank and ran new wires to the drive unit, too. The electronics box also has the built-in heading dial, which the watchstander must occasionally adjust. The most convenient place to locate the electronics box was to strap it on top of the toilet seat in the aft head, which is a few steps away from the companionway ladder (we aren't using the aft head at present). Amazingly enough the new installation worked, except for a reversed heading dial. As I write this, the autopilot has been working reliably for several hours, steering the boat quite accurately under difficult conditions of wind and swell, so this might do the trick. Hooray yet again for David! Because the autopilot is working again, we'll go back to regular watches. One reason we're having a difficult time is that Nine of Cups has only one means of automatic steering, the autopilot, and it's proving to be not very reliable. Although they have some spares aboard, the autopilot company has a poor reputation for customer service, so if a problem can't be solved by swapping-in spares, David and Marcie may be up the creek. 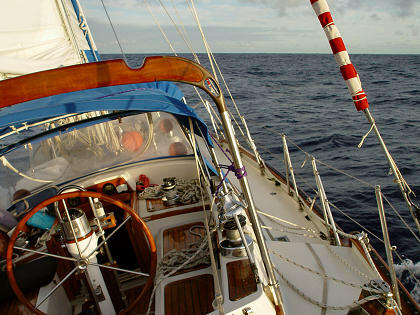 Many long-distance voyaging boats have two independent means of automatic steering, for example, an autopilot and a wind vane, or two different autopilots, etc. Then, for each device, they would have an appropriate set of spares. By putting all our eggs in one basket, we can (and did) run into some serious problems. The weather today was mixed with sun, clouds, and some rain. There were a couple of humongous clouds with lots of vertical development and exhaust plumes coming out the top, but we managed to miss them. We might actually be in the Pacific High, since we have been through various parts of a high-pressure system for several days now. Sailing back to Easter Island on a day with decent weather. I took these pictures on my morning watch. I had an easy night watch thanks to the working autopilot, plus we're back on regular four-hour watches. During my night watch, I noticed an interesting difference between the two-hour and four-hour watches. While hand steering on a two-hour watch, time seemed to pass quickly. The relatively simple task required constant attention and completely occupied my mind. It was a dumb, routine, almost mindless task but since it completely occupied my mind I was unaware of time or its passing. Every time one mile ticked off, I allowed myself the luxury of peeking at the GPS clock, and I was usually satisfied if not amazed by how quickly time had passed. On the other hand, while watchstanding using the autopilot, there's nothing to occupy my mind and time seems to pass slowly. The notable exceptions are the truly beautiful warm nights where you can establish and maintain a time-passing reverie. Lately, the nights have been a little chilly, and any incipient reverie frequently gets dashed by thoughts of creature-comfort deficiencies, like getting a blanket, zipping up my hood a little tighter, or putting on shoes, etc. The worst nights are when it's chilly, windy, rainy, and bumpy—time grinds nearly to a halt. If it's that bad, though, we usually shift to two-hour watches since otherwise it's just too unpleasant. I'm pretty sure that last night I saw the zodiacal light, which is only the second time that I've seen it. The zodiacal light is caused by sunlight reflecting off dust particles orbiting the sun. It's normally hard to see since it requires very dark and very clear skies, conditions not easily found back in the States (at least on the East Coast). After the sun set and it became pitch black all around, I could see zillions of stars. I could also see a dim light in the west-northwest, where sun had set, although the light was not in any way a remnant of the sunset, which was long over. The light was roughly triangular, broad at the horizon and narrowing higher up, and was about three fists wide and five fists high. The triangular portion extended up to Jupiter, and a very faint shaft or lane of light seemed to extend well above Jupiter. It was hard to tell but I thought I could see the lane of faint light connect with the opposite horizon. The main triangular section was as light as the Milky Way (which was quite bright) but the light was smooth and diffuse compared to the blotchiness of the Milky Way. The triangle was nearly vertical, leaning slightly north. Looking to the south, I also could see the Large and Small Magellanic Clouds hovering above the horizon (they are small galaxies that orbit the Milky Way). Although the Large Cloud is frequently visible, this is the first time I have seen the Small Cloud, no doubt because the sky was exceptionally dark and transparent. Unfortunately, local weather clouds arrived and spoiled the view. 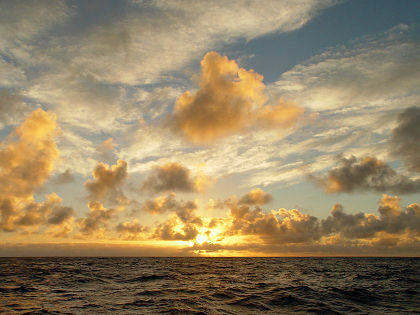 With only 140 miles to go and with good winds, we should arrive at Hanga Roa tomorrow in the late morning. I'm now shifting my mindset from passage mode to arrival mode. Plus, once we arrive, I'll be leaving the boat I have called home for the past three months (three months to the day, tomorrow). The question is whether we'll be able to anchor off Hanga Roa, and if so, will I be able to get ashore without getting dunked. Then there are the logistical chores once ashore—airplane ticket, crew list, hotel, laundry, email, sightseeing, souvenirs, postcards, plus diesel and provisions for Nine of Cups. Not to mention taking a luxurious hot shower in a spacious room that stands still (and letting somebody else clean up afterwards). Although I am anxious to leave and return to my previous life, just the same I know I will greatly miss being on such a grand adventure and being such a close and integral part of Marcie and David's cruising lifestyle. Although I got homesick after three months, I think I could do this for the long-term (such as a few years), but only if I have only one "life" - the cruising/voyaging life. Right now, I have two lives: the temporary life as a voyager on Nine of Cups, plus a completely separate life on-hold back in Baltimore. So I inevitably get pulled in two directions—adventure vs. home. The solution, of course, is to do what David and Marcie have done: take you home with you and close out all your previous lives and just live the voyager's life. There's nothing pulling you back home, because you are home, on your boat. The only tugs you feel are the pangs of curiosity and excitement pulling you over the horizon to yet another marvelously new and unique port-of-call.